I am often humbled to work as a life coach. Hearing peoples honest stories of what they put up with and all. Over the years I have learnt so much about the human condition, the traps we build for ourselves and the stories-of-smallness we convince ourselves of. I could write a book. One condition that I hear about almost on a daily basis is The Rat Race. I have worked with hundreds of people who tell me that they feel caught in the treadmill of life. Their work-day looks something like this... Get up, rush, commute, role-play, politic, rushed lunch, role-play, accomplish, ego play, abusive boss, drink alcohol, commute, beer, telly, fall asleep…. ALARM! Go do it again! What is your typical workday like? Is that how you want it to be? Have you ever considered that you could live your life differently? 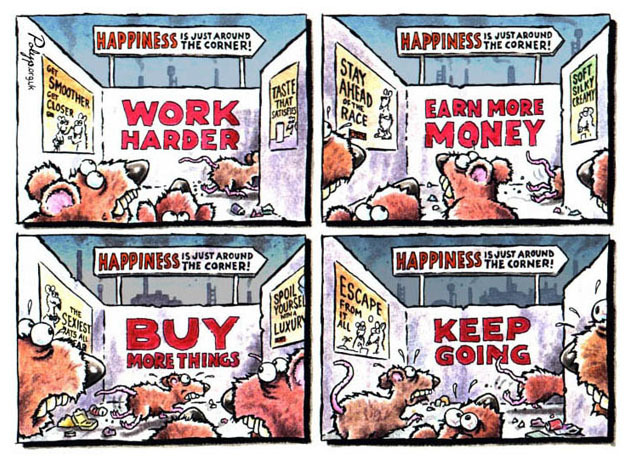 They call it the rat race. If you live your life like that what does it make you? Are the rats being drugged up on anti-depressants to keep them quiet while they spend their lives in this way? Does your company post big profits? Does your boss care about the treadmill feelings that you may experience? Perhaps he lives that way too! Are you eating and drinking emotionally to numb the madness in all this? Where is it all heading? A bit of a rhetorical outburst perhaps, but I wanted to get your attention to let you know that you don’t need to be a rat in any race. I invite you to take a moment to STOP. Take a breath, look around you right now. Notice something you haven’t seen before. Then look back at yourself and take stock. The Dalai Lama has this to say "...sacrifice your health in order to make money. Then you sacrifice money to recuperate your health. Then you are so anxious about the future that you don't enjoy the present: the result being that you do not live in the present or the future; you live as if you are never going to die, and then you die having never really lived." ... It doesn't have to be that way! Are you living the life that you always dreamt of? Many of my clients explore their relationship to the rat-race during our work together. As a life coach I can reveal to you the life skills that are necessary to get out of the race. I can help you bring real meaning into your life. My gift is to help you embrace your career as a path of meaning and happiness. Take up the challenge of redesigning your relationship to the rat race. Using a safe and supportive coaching style that fosters your freedom of expression, I will challenge you, open you and inspire you. Together we will explore your truest nature. I will help you regain balance in your personal and working life and to align with your true values and fullest potential. Using a stimulating and customised coaching program, I will help you design and implement your great future. If you are looking to change your life situation, if you describe yourself as lost, stuck or caught in the rat race get in touch, what do you have to lose? Your Self is a magnificent thing. Do you have the balls to manifest it, with every body around you staring at you? Life Coaching can specialise in giving you balls! Want to get creative… The Rat Race likes to talk about how bad it all is… Turn off the news and listen to music instead -- The creative part of your self is sensitive, easily upset by the negative stream that passes through the news media. Therefore, limit or completely turn off the news. Once you wean yourself of it, you'll find that you really don't care what the headlines are.